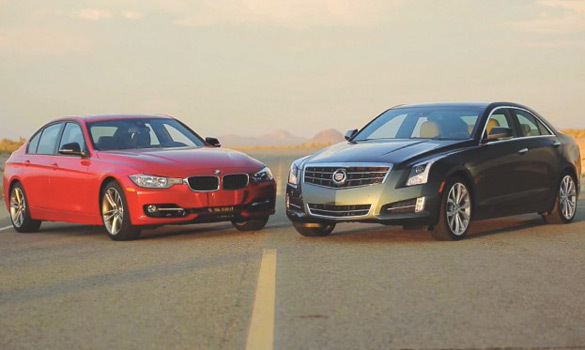 The new 2013 Cadillac ATS has been boasted as the American answer to the BMW 3 Series. The question that remains to be answered is if the new ATS would be a victor in a head 2 head battle against the BMW 3 Series. Motor Trend wants to settle this debacle once and for all by pitting the new Cadillac ATS 2.0 Turbo against the BMW 328i. Both are rear-wheel-drive sedans and both have a force-fed 4-cylinder engine. The Cadillac ATS boasts 270 horsepower and 260 ft-lbs. of torque. The BMW 328i has 240 horsepower and 255 lb-ft. of torque. We now know BMW’s power figures are a bit underrated. 0-60 mph times are 6.0 seconds and 5.5 seconds for the ATS and 328i respectfully. The ATS could have had a much better time but was hindered due to a second-gear shift at 55 mph. Quarter mile times are almost the same posting 14.1 seconds at 98.2 mph for the BMW and 14.4 seconds at 96.9 mph for the Cadillac. Specific tests only say so much about these vehicles on paper, so Motor Trend elaborates more on other dynamics of each vehicle and conclude with a winner. Does the Cadillac have what it takes to compete with the best from Bavaria in an overall battle? Hit up the Head 2 Head video below to find out and be sure to post your opinions and comments below. If you’re shopping for a German luxury sport sedan on a relatively tight budget, and you prefer new cars to used, chances are very good that you’ll be cross-shopping the BMW 328i against the Mercedes-Benz C250. Both are comparable in size and price, and both now derive power from turbocharged four cylinder engines. The BMW gets a 2.0-liter four, rated at 240 horsepower and 255 pound-feet of torque. This helps the car sprint from 0-60 mph in just 5.6 seconds, yet it still manages to return 36 mpg on the highway. The Mercedes-Benz, on the other hand, makes due with a 1.8-liter four, good for 201 horsepower and 229 pound-feet of torque. That’s still enough to propel it from 0-60 mph in 6.9 seconds, while returning up to 31 mpg on the highway. While these numbers serve as reference points, the real value of a sport sedan comes from feel. How it communicates to the driver in a corner is, to some degree, even more important than how fast it accelerates off a stop light. Factor in the luxury aspect, and driver comfort becomes equally important. There’s a clear winner in this comparison, and there’s really no surprise which car comes out on top. 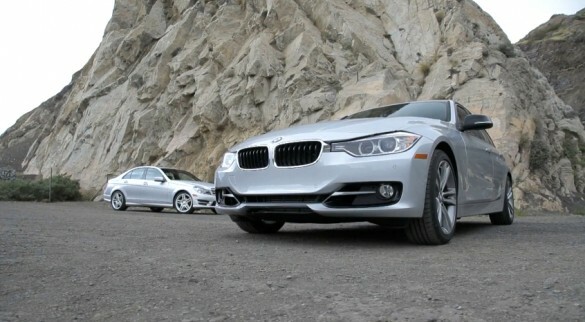 It’s worth pointing out that the BMW 328i is all new, while the Mercedes-Benz was last updated in 2007. A new C-Class model is under development, so a comparison between the new 3 Series and the new C-Class may be a closer dogfight.